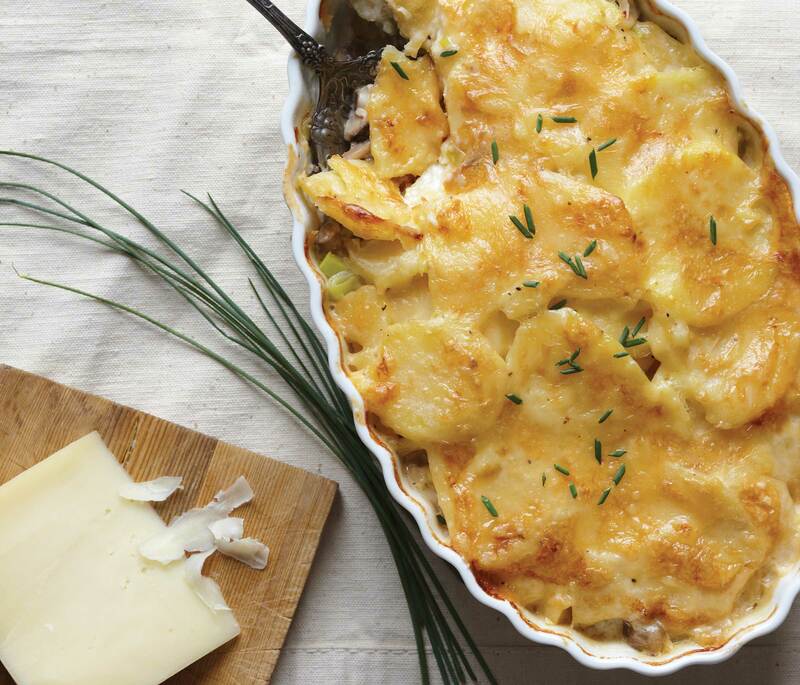 Comfort food meets gourmet taste for this potato gratin dish. Perfect served as a side dish for your next family gathering. Next is our Fall Recipe series, we’re cooking up the ultimate comfort foods for any evening including Thanksgiving. 2. Heat 1/4 cup oil in large skillet over medium-high heat. Add leeks; sauté until soft and lightly browned, 10–12 minutes. 3. Add mushrooms, sprinkle with salt and pepper, and sauté until soft and liquid evaporates, 7–8 minutes. 4. Add garlic; sauté 1 minute. Season with salt and pepper. Set aside. 5. Combine half-and-half, 1 teaspoon salt and 1/2 teaspoon pepper in large pot. Add potatoes.Bring to boil; reduce heat to medium and simmer, covered, 10 minutes, stirring occasionally. 6. Remove lid; simmer until cream is reduced by about half, stirring often and watching closely to prevent mixture from burning, about 5 minutes. Season with salt and pepper. 7. Brush 13″ x 9″ x 2″ glass or ceramic baking dish with oil. Transfer half of potato mixture to dish, spreading out in even layer. Spoon mushroom mixture in an even layer. Spoon remaining potato mixture, spreading in even layer. Sprinkle cheese over top. 8. Cover with foil, tenting in center to prevent cheese from sticking to foil. Bake 30 minutes. Uncover; bake until potatoes are tender and top is brown, 20–25 minutes longer. Let rest 10 minutes before serving.